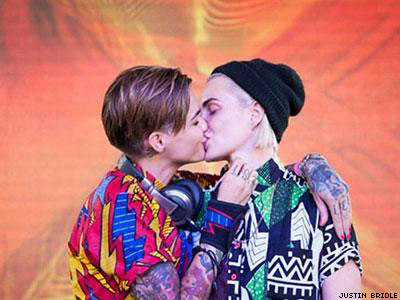 Joining other inspiring models — including Andreja Pejic, who came out as a transgender woman earlier this month — Australian model and DJ Ruby Rose has come out as gender fluid. She also identifies as gender-neutral, according to AU News. The popular entertainer, who rose to fame for her stint on Australian MTV and highly recognizable tattoos, discussed identifying as both male and female (though she prefers to continue using female pronouns) recently with the Guardian. Her openness accompanies the release of her short film, "Break Free," which she describes as a video "about gender roles, Trans, and what it is like to have an identity that deviates from the status quo." In the Guardian interview, she adds that filming it was "really intended to be therapeutic for myself." "Obviously it's very autobiographical. As a little kid, I was convinced that I was a guy. I used to bind with ACE bandages, which is really, really bad for you … I used to pray to God I wouldn't get breasts," she continued. "Then in my teens, I tried to be quite feminine. … And after a little bit [I] chopped everything off and am kind of back where I started." The video, which includes images of Rose cutting off long, blond hair, removing her make-up, binding her breasts, and donning a phallic prosthetic, has been making waves, nearing one million views thus far.